INFO: In 2011 he took the title and shirt 9 of Internacional. He was champion, best player and top scorer of the Campeonato Gaúcho, with 17 goals in 13 games, totaling an average of 21 goals in 21 games until the month of March. A very high average, the same one that has already felt high. 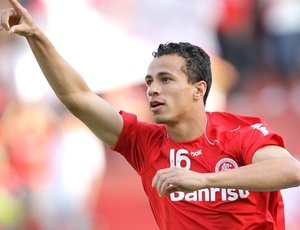 On August 21, 2011, in the game against Flamengo, in the field Beira-Rio, the player made a game exuberant. He gave an assist, heel, leaving Indio free, to score the first goal colorado in the game. In the second half, he scored the most beautiful of his career: he put a beautiful bike, tied the game in 2-2. On August 24, 2011, he won his title as a professional, the Recopa and was the protagonist. In the first game of the final, he scored the goal in a 2-1 defeat by Independiente in Argentina. In the game of the return, two low goals, remembering the good old days, in the victory of the Internacional by 3 to 1, in Beira-Rio, and conquered the bicampeonato of Recopa South American. Last edited by lutchi65 on Wed Nov 07, 2018 2:47 pm, edited 6 times in total. Are you sure about tech? Maybe a few points higher in DA, DS and TEC and what about SPE, ACC and AGI? I don't know of he was so fast but considering his size.. He is not very fast, had a good acceleration continues, but was slow to dribble and start, is more an area player, who had a lot of willpower and risks many dribbles ... technically is not a good player, is a player who works more with the body.